Chicago is the 2nd largest city on the Great Lakes and the third largest city in the United States. Established in the early 19th century, Chicago grew into a very important transportation hub linking the settled eastern United States with the newly-opened territories of the west. With the arrival of the railroads came industry. Chicago's sprawling railyards brought cattle from the west for processing and its emerging meatpacking industry became one of the city's ecomomic foundations. Throughout the 1800's, Chicago grew at an enormous pace as Americans and immigrants alike poured in. The Great Chicago Fire in 1871 led to a complete rebuilding of the downtown. Major improvements to public health and sanitation were instituted including reversing the flow of the Chicago River to solve the problem of polluting the city's drinking water supply from Lake Michigan. Chicago continued to grow and flourish throughout the 20th century. It is a fabulous city to visit. There is something that will appeal to every cruising sailor - art galleries, museums, sports venues, theatre, great music, shopping - Chicago has it all. Chicago has invested nearly 200 million dollars into its waterfront - and it shows! Ten harbours have slips and mooring for 6,000 boats. 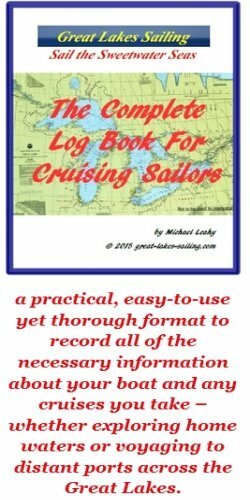 Starting from the north, we will look at the six of these harbors that would be the useful and interesting to a cruising sailor. If you need to clear into the United States at Chicago, call the Customs and Border Protection Service (312)-894-2900. There are no specialized services in the individual harbors. There is a US Coast Guard station located in Chcago Harbor It is a sub-station of a larger parent unit based in Calumet Harbor, at the south end of the city of Chicago harbor system. Additionally, the USCG has a base in Wilmette, about 7 nm north. These three units provide excellent coverage of the Lake Michigan waters around Chicago and can provide a rapid response to assist the police marine unit. The Chicago Police Department Marine and Helicopter Unit provides marine policing and search and rescue services throughout the Chicago harbor system. The city of Chicago has a number of harbors extending across its extensive waterfront. These are listed below and link to individual harbor reviews Altogether, there are over 6,000 slips available for boaters. The main harbor entrance is via the Chicago Harbor Light. This route leads you into the centre of the city, at the mouth of the Chicago River. The approaches are clear from all directions. The approaches to individual Chicago harbors are detailed in each harbor review. Select from the harbors listed below. While there are a number of marine facilities to choose from across the Chicago waterfront, there are only two harbors where there are full fuel docks. These are Belmont Harbor and Burnham Harbor. There are no repair or maintenance facilities in the individual harbors. All of these services are located on the Chicago River or in Calumet Harbor at the southern end of Chicago. A major marine repair service for sailors is Crowley's Yacht Yard. Crowley's is located at the south end of the Chicago waterfront in Calumet Harbor. This is a full-service yard that can carry out a wide range of repair and maintenance work including engines and mechanical systems, electrical, rigging, fiberglass and woodworking. They have a large chandlery which can be accessed on-line as well. Chicago Yacht Yard is located on the South Branch of the Chicago River, approximately 5 nm from the river mouth. This is a full-service yard. Their services include a complete array of mechanical and restoration services, fiberglass, carpet, canvas, wood restoration and repair, rigging, electronics, heating & air conditioning, engine work, pump systems, bottom paint and detailing. They have a mobile service available to any harbor in the city of Chicago harbor system. UK Halsey Sailmakers is a full-service sail loft located about .75 mi/1 km from Burnham Harbour. Part of UK Sailmakers world-wide group of sail lofts, they can provide a full range of design and maufacturing expertise and service. They also carry out repairs and recuts. The city of Chicago is blessed with an excellent network of health care institutions. For services close to various harbors, see the individual harbor reviews. Chicago has an outstanding selection of restaurants and pubs, as you would well imagine in such a major city. For choices close to the waterfront, see the individual harbor reviews. The city of Chicago is renowned for the extent and variety of attractions for visitors. See individual harbor reviews for activties in their respective areas. Explore this extensive City of Chicago tourism site to load up on ideas to get the most of your visit. Select from the list below to see the specific information on each individual harbor.